What a sweet record. That was my first thought when Nappy Brown's latest release on Blind Pig Records, the appropriately named Long Time Coming, finished its spin in my CD player. I’d had the opportunity to talk with the producer of the record, Scott Cable, when I was in North Carolina for the National Women in Blues Festival and he was extremely gratified to have been part of this project. And rightly so I might add. Surrounded by an all-star band that includes Sean Costello on guitar, Mookie Brill on bass, Big Joe Maher on drums, Chris Stern on piano and guest appearances from Junior Watson, Bob Margolin, Jim Pugh, John Nemeth and others, Nappy’s in perfect form as he leads the band through the first cut, “Keep On Pleasin’ You.” His whole focus is on keeping the woman he loves happy, “Baby, baby, I’m in love with you…when you are happy…that makes me so happy too!” Sean Costello provides a blistering guitar lead that supports Nappy’s strong, clear vocals in every way. It’s clear from the get go that this is going to be a special record. I wasn’t aware that Mookie played harmonica as well as the bass, but it’s his harp that makes an appearance on the second cut, “You Were A Long Time Coming.” Next up is Nappy’s classic tune, “Don’t Be Angry.” “Don’t be angry….I know I was wrong”. Nappy’s clear that he’s the one who caused his woman pain and he won’t do it again, “I promise you my darling….I won’t hurt you again!” Junior Watson’s guitar accentuates Nappy’s apology as Junior makes his first appearance on the record. Next up is Nappy’s version of the classic Willie Dixon tune, “Who”. “Who…told you…I was stepping out on you…whoever told you baby…really told you the truth!” It’s Junior Watson’s turn again to hold court on his guitar and his distinctive style adds the finishing touches to this classic version of Willie Dixon’s tune. Bob Margolin adds his acoustic guitar touch to the intro of “Cherry Red” as Nappy begins to sing “Cherry Red.” “Take me pretty mama…lay me down in your big fat bed…I want you to rock me pretty mama…till my lips turn cherry red!” Margolin’s fret work adds just the right touch of intimacy to Nappy’s vocals as he works to convince his woman to take him to bed. Since I live in Arizona, the next cut, “Aw Shucks, Baby,” is of special interest to me. Recorded here in Phoenix, it features some of the last recorded drum work of Chico Chism, wonderful upright bass by Mario Moreno and the harmonica talents of Bob Corritore with an all-star band that also featured Kid Ramos, Henry Gray and Johnny Rapp. The B3 of Jim Pugh leads us into Nappy’s next song, “Every Shut Eye Ain’t Sleeping.” “Every shut eye ain’t sleepin baby….every goodbye ain’t gone…so don’t try and fool me baby…cause I’ve been here…a little too long.” Nappy loved this woman and tried to do right by her, but she just didn’t treat him right at night and had to go. More of Clark Stern’s keyboard work accentuates the next tune, “Bye Bye Baby.” “I feel so doggone blue…I can’t believe we’re through…because…I’m so in love with you…but if…you should change your mind…please…please drop me a line…cause I’m yours…till the end of time!” Nappy loved this woman so and you can hear the pain in his vocals, it was just her time to go. Nappy Brown’s roots are both in gospel and blues so it’s fitting that the final song on the record is the gospel tune, “Take Care of Me.” “I know my robe’s going to fit me well….cause I tried it on at the gates of hell…take care….take care of me, Jesus!” A beautiful gospel number; I understand why Scott wanted Nappy to include it on the record. Long Time Coming has been by far, one of the best records I’ve heard this year. We’ve lost so many of our legends --- Henry Townsend, Robert Lockwood, Jr., Big Joe Duskin, Carey Bell and others this year --- that I am heartened by the fact that Blind Pig Records and Scott Cable were able to produce a record that still has Nappy at the top of his game. 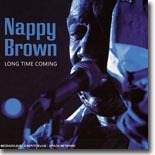 Fans of Nappy Brown will be delighted to hear this record. Sean Costello’s guitar work on the album is outstanding and the rest of the players give stellar performances as well. It’s a record worthy of Blues Music Award nominations and I’m curious to see how it fares. It’s my understanding that Nappy will be touring in support of the record on the festival circuit next year and I sincerely hope I have the opportunity to catch him live somewhere along the Blues Highway.